Summary of Assignments: Stationed in Europe for two years following OCS with the 3rd Armored Division (1966-68). 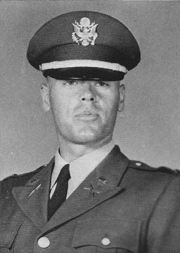 Extended his commitment to go to Vietnam after completing Vietnamese language school at Fort Bragg, North Carolina (July 68-October 68). Served in Vietnam from 68-69 as a MACV advisor in IV Corps. Separated from the Army following his tour in Vietnam. Jobs/Profession following military: Highway Construction Engineer/Estimator (66-68), Highway Construction Superintendent (78-03), Construction Company Purchasing Agent (03-present).